So today we see the SGC conduct a marriage ceremony and also deal with The Trust being even more evil. The day begins with Daniel talking with O’Neill about the latest news with the rebel Jaffa, with Bra’tac trying to get a combined overthrow on as many worlds as possible while Ishta, leader of the female rebels, wants to strike as soon as possible. When Bra’tac returns with an angry Teal’c however it turns out there more pressing concern is not the war but that Teal’c’s son Rya’c is planning to get married in three days’ time without having told his father until now. O’Neill talks with Teal’c to find that Teal’c believes that Rya’c is too young and that it’ll make him weaker in battle, most likely a fear born from his own issues in the early years of the SGC. Their conversation is cut short however when Ishta comes through the Stargate, believing that their current hideout has been compromised. The base soon begins receiving the Hak’tyl so that they can avoid being killed by the Goa’uld Moloc while they search for a new home including Rya’c and Kar’yn, but there are already cracks emerging in the relationship with Rya’c still quite traditional in his beliefs while Kar’yn is much more modern in her outlook when it comes to things like equality of gender. To the base’s chagrin it turns out that they will now be holding the couple’s wedding ceremony on the base. Teal’c also meets with Ishta, with the two continuing a similar argument as the younger couple regarding how to best carry out their traditions and how to best destroy Moloc. As planned the preparations for the marriage go ahead as planned, with a rehearsal being carried out with Bra’tac officiating the ceremony. The rehearsal however goes badly when many of the rather patriarchal elements anger Kar’yn, leading to an argument between the two young Jaffa much to Teal’c’s happiness. The falling out is interrupted however when an off-world transmission comes through regarding the status of Ishta’s allies who still hide amongst Moloc’s forces, with Ishta taking Teal’c to a meeting with their leaders. The meeting goes ahead as planned on the Hak’tyl’s new world with both Ishta and Teal’c trying to convince the others of their differing views. Shortly thereafter however it turns out they’ve been betrayed when the entire party bar Teal’c, Ishta, and another Jaffa Aron are killed by Moloc’s forces. Though they attempt to make it to the Gate they find it heavily guarded but are able to warn the SGC when O’Neill dials the Gate as scheduled to make radio contact. The three Jaffa hunker down for the night but wake to find Ishta is gone, having been captured by Moloc. Teal’c and Aron argue over what to do, with Teal’c viewing Aron as the traitor who sold them out, leading Teal’c to zatting Aron and launching his own plan. Teal’c begins an attempt to free Ishta with the help of the SGC, who first use a UAV to attempt to target the Jaffa positions and deliver more Tretonin to Teal’c but it’s shot down. Teal’c manages to make his way to the crash site and recover the Tretonin but is surrounded by many Jaffa, only to be saved by Aron proving that he’s not the traitor. Following this Teal’c launches an assault on the tent where Moloc is holding Ishta while Aron uses the laser designator from the UAV to target the emplacements at the Gate, killing Moloc in the process as he attempted to leave the planet and put down a revolt on his homeworld. In the aftermath the two Jaffa return to the SGC to witness Rya’c and Kar’yn’s marriage ceremony, which has seen the removal of many of the more controversial elements. As Teal’c and Rya’c talk in the hallways about their honeymoon Teal’c warns him about a certain tradition but Rya’c says that his wife is right in not following all traditions. In the gateroom the Hak’tyl go back to a new world, learning that Ba’al has captured Moloc’s old territory, and Ishta and Teal’c share a kiss before she departs. I always find myself surprised by just how much I enjoy this episode written by Judge and in a way I can’t help but feel it’s an apology for the cockup that was Birthright last season that introduced us to the Hak’tyl. While back then they were little more than the Amazon planet trope here they actually have more depth as characters and as a society. 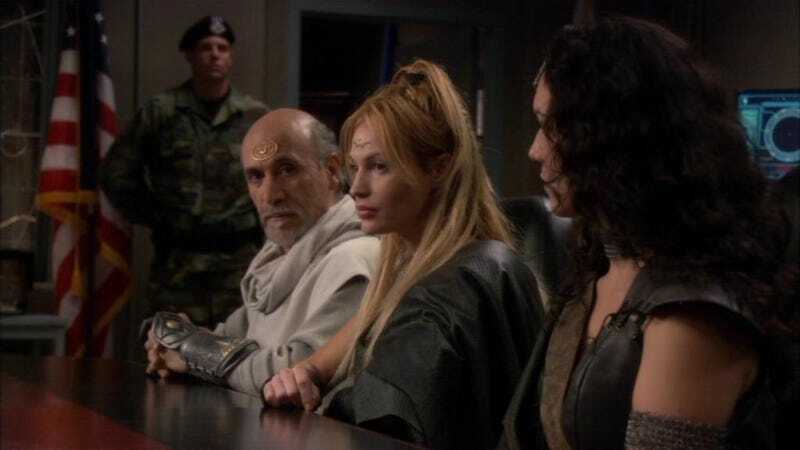 Much of the plot revolves around the issues relating to the increasing freedoms that the Jaffa are enjoying now free of the Goa’uld, in particular when it comes to equality between the genders which the Hak’tyl are much further in favour of compared to others. Here we see the issues in the form of the two relationships between Teal’c and Ishta and then Rya’c and Kar’yn. In the former many of the issues are down to wanting to be free from their oppressors and would it rather be better to suffer for longer for a more hopeful outcome or to risk everything now while in the latter it’s more a look at what traditions of their own should be remembered or forgotten in this brave new world of theirs. Out of the two the latter is probably the more interesting of the two scenarios as the former is more a slight adaption of the longrunning issue of how to deal with the Goa’uld. The marriage subplot however sees the issues facing the Jaffa placed right front and center, with Rya’c taking the idea that Kar’yn is uncomfortable with some traditions as an insult on his manhood while she likewise sees his inability to adapt a signal of disrespect and stubbornness. The difference between traditions and the wanting of release from the more controlling aspects of them was something that was always going to happen following the downfall of the Goa’uld and the fact they show it on screen is a good decision as the show has lacked some of the earlier commentary from the start of the show. Thankfully unlike some of those earlier commentaries however this doesn’t see the commentary shoved down your throat like say Emancipation where we are shown that Jaffa women are just as capable as the men without the need to tell us every five minutes how evil men are. Obviously though this is more the latter scenario again as the former still sees Teal’c save the day again, but this not as controlling over Ishta. Overall the episode is a much better version of the Hak’tyl, not reducing them to simply a tired trope, and sees the issues that will plague the first generation to be free from the Goa’uld as they attempt to decide who they are as a people. · Tretonin is carried everywhere but very fragile? Great idea SGC. · Haven’t seen the UAV used for a while now. · Wonder if Bra’tac is a functional alcoholic? In the control room Harriman and another technician are manning the graveyard shift at the base, there just in case anything goes wrong off-world. As the two of them get coffee the room lights up behind them and when they turn back they find the Gate has disappeared. Daniel gets their story down for O’Neill and the others before they begin to try and find out just how a giant metal ring disappeared from inside a mountain, finding from the video footage that it looked like Asgard tech, with a technician having placed a beacon of some kind on the Gate. Most pressing however is what to do now given that without a spare Gate anymore all off-world teams are stranded, including Teal’c who was visiting rebel Jaffa. Off-world Teal’c visits the Alpha site to try and find out what happened but gets no answers from his colleagues as they also can’t contact the SGC. Rather than wait he decides to visit a planet occupied by Rebel Jaffa forces to borrow a ship from them that can get him to Earth quickly, only to find all of the Jaffa are dead except for M’Zel who also arrived later on to find the others dead. The two of them decide to try and find out what did this, only finding more dead encampments along the way. After returning to the Alpha Site with M’Zel the SGC teams there confirm the use of Tok’ra symbiote poison and believe that the Tok’ra are killing Jaffa indiscriminately in desperation. Back on Earth the SGC and NID team up to track down the rogue technician, only finding a warehouse stockpiled with rocket and what appears to be nerve gas, which is released during a shootout but is revealed to be Tok’ra symbiote poison suggesting that the intended targets are off-world groups like the massacres Teal’c found. The team instead decide to next hit Area 51, finding a shifty looking scientist who’s been helping The Ring who inadvertedly leads them to his employer. After chasing the Ring agent Carter zats him and uses his teleport to beam up to a Al’kesh vessel, finding herself zatted almost immediately by the Ring agents awaiting her. At the SGC the interrogation of the scientist goes nowhere until they agree to let him keep his ill-gotten gains, whereupon he reveals the location of the Al’kesh. Off-world the two Jaffa deliberately get themselves captured by forces operating unknowingly for a covert Tok’ra agent. Upon confronting her about the killings she denies all knowledge of using the symbiote poison. Before they can talk further however the planet is the next to be hit by The Trust’s symbiote weapons killing the Tok’ra, her army, and M’Zel. At the SGC Daniel decides to infiltrate the Al’kesh and try and rescue Carter or at least reveal the location of the Al’kesh to the Prometheus. While he manages to do the latter by turning off the ship cloak he is caught by The Trust when they detect the shield lowering. The Trust prepare to kill the two SG members but the Gate is suddenly dialled to reveal Teal’c from the other side who comes through to assist the two of them, killing one of the agents. The remaining agents prepare to jump to hyperspace but the Prometheus are able to beam the Gate and SG-1 off the ship just before it escapes. So here we have The Trust once again returning as well as the NID and the Stargate version of Area 51 which has the worst security of all time. So the story sees the return of The Trust once again, the evil continuation of the corrupt wing of the NID and their Big Business sponsors, and this time boy are they even more evil than before. Rather than just using the SGC to obtain technology for their benefit while defending the Earth, they’ve now decided that instead the best option is to just wipe out every single Goa’uld planet and all their Jaffa at the same time. Even by Maybourne and Simmons era standards this is a pretty big leap in nuttery regarding their actions as while the previous two were willing to go to quite extreme and uncaring lengths to supposedly help the Earth never before has the view regarding other life been so little. Outside of this the team return to Area 51, not visited for quite a while now, and even after several incidents of corruption at the institute they’re still unable to actually secure the place, with one scientist able to unobserved not only get a teleport working but also sell the information for several million to the Trust. It’s honestly a surprise that anything the SGC do is still secret. Off-world not only do we see the genocidal results of The Trust’s new mission, with many worlds of Free Jaffa wiped out by the weapon simply due to The Trust having out of date intel, but also just how far relations between the Tok’ra and the Jaffa have fallen since the alliance collapsed in Death Knell last season with the idea that the Tok’ra mass-producing the symbiote poison and using it repeatedly is seen as very possible. It’s a long distance from only a few months before where they were sharing resources in the fight against the Goa’uld. In the end while the episode might have some very tenuous logic at how events unfold it’s still another great intrigue filled Earth-based adventure that also sees the Tok’ra return after a long absence. · Wonder what would’ve happened if they had a squad of marines hold hands and try and beam up together. · How much of the poison did the SGC produce?